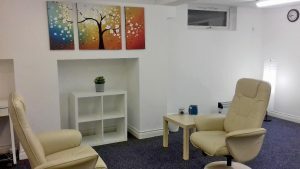 The Oak Hill Centre is a large open plan space that is suitable for all types of talking therapies including individual, couple and family therapy. There is also space to run groups and workshops. Plus enough space for beauty therapists, massage therapists, yoga and Pilates classes etc. 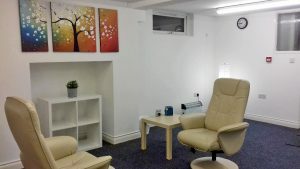 The Oak Hill Centre is situated at 171 Bury New Road (lower ground floor office suite), Prestwich Manchester M25 9ND. It is on the corner of Butterstile Lane and Bury New Road. The centre is set to the lower ground floor of a very impressive four-storey vintage building. It has toilet facilities and a kitchen area with fridge. The Oak Hill Centre is in a quiet area with easy access to the M60 motorway. Its also close to Manchester city centre. The car park is available to clients and is accessed via Butterstile Lane. 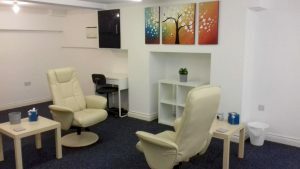 I also offer a referral system to therapists who rent rooms in Oak Hill Centre. 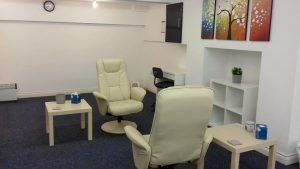 Suitable clients who contact me for various types of therapies are then referred to therapists working in the Oak Hill Centre. There is a small referral fee for clients who begin working with the particular therapist. This is a great opportunity to be part of the referral scheme where you could benefit from building your private practice through suitable referrals.